Step 1 : Heat a Pan with little oil on medium flame.saute 1 cup of chopped onion with 10/12 cashews until they turn lightly brown. Step 2 : Add 1 cup of chopped Tomatoes and saute for minute on medium flame until tomatoes turn mushy and softer.After cooked transfer to the plate and wait for cool down completely. Step 3 : All the cooled prepared tomatoes and onion to a mixer jar .Blend it to smooth paste without adding water. Step 4: Add 2/3 tablespoon oil in the pan and heat up on the high flame to getting a smoky flavor.Add 1 chopped capsicum and onion.cook on high flame until they half cooked.Toss it multiple time for prevent burning. Step 5 : Add paneer, make sure before adding paneer in the pan,It is not so much moist.1/2 minute and toss it constantly.cook on medium flame.Do not over cook else the paneer turns hard.Transfer all these on plate. Step 6 : Add little more oil,ginger-garlic paste and saute for seconds.Add the ready made masala and saute it well until it turns aromatic. Step 8 : Saute all well for 2 minutes again 2/3 minutes again. we don not need to cook till the leaves the sides of the pan. Step 9 : Add 1/2 to 3/4 cup of water and stir well bring this to boil.Allow the gravy well and thicken.Next to towards add kasuri methi. Step 10 : Add sauteed onion.capsicum and paneer that we made in earlier steps.Turn of stove.Mix all well. Step 11 : Add chopped coriander leaves.cover and set aside for 2 minutes.Remember do not leave on hot stove. Step 12 : Transfer to a bowl and rest for 15 minutes for paneer absorbing flavours. 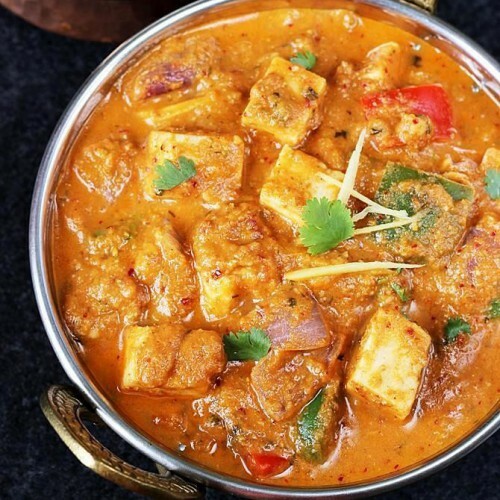 Finally: The tasty kadai paneer recipe restaurant Style is ready. Serve it with chapatis.